Recent 5-star review of Lords of Dyscrasia on Amazon! S.E. Lindberg leads us on an amazing adventure into character and danger with his first in a series, "Lords of Dyscrasia." Lindberg's work is dark, violent; sometimes beautiful, sometimes lyrical; always thoughtfully written. For an emerging writer, Lindberg takes many chances, and almost always succeeds. He is a more thoughtful writer than many, exploring the psyches of humans and their gods. Lindberg is a chemist, and in this story disease corrupts the the characters and their faith in themselves and one another. I loved it, but I am hesitant to characterize it. 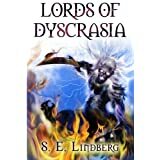 Is Lords of Dyscrasia it high fantasy, heroic fantasy? You decide. A dyscrasia is a term the ancient Greeks used to describe imbalance of the four humors needed for life. In Lords of Dyscrasia, these medicinal or physical humors manifest as muses for artisans, dispensers of magical power, and the manifestations of disease. Lindberg twists this sophisticated ancient construct into an unexpected shape, as is his wont. Lindberg is a bold and literate guide to a uniquely-imagined world, with a deep love for fantasy conventions and equally for surprises. When the soul of a dying queen becomes infused into the blood of a human artisan, the soul of the queen passes through his blood and into his offspring, preserving the bloodline... I'll say no more about Ante and the adventures swirling around him.